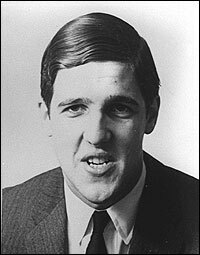 Yep, that's him -- John Forbes Kerry, during his student days at Yale. I can't fault him for not revealing his school records during the 2004 campaign. Never mind dishonorable discharges -- that picture alone would have given a few million votes to Bush! Oh, and a comment I haven't seen elsewhere yet -- why on Earth does college-age Kerry look like he's sporting a comb-over? More than thirty years later, we know that he doesn't wear a rug. (At least, we think he doesn't.) Why would anyone wear their hair that way if they didn't have to? And those teeth... oh, my. I look at them and think "underbite" and "halitosis" simultaneously. I didn't know I could do that. UPDATE: Be afraid. Be very afraid.